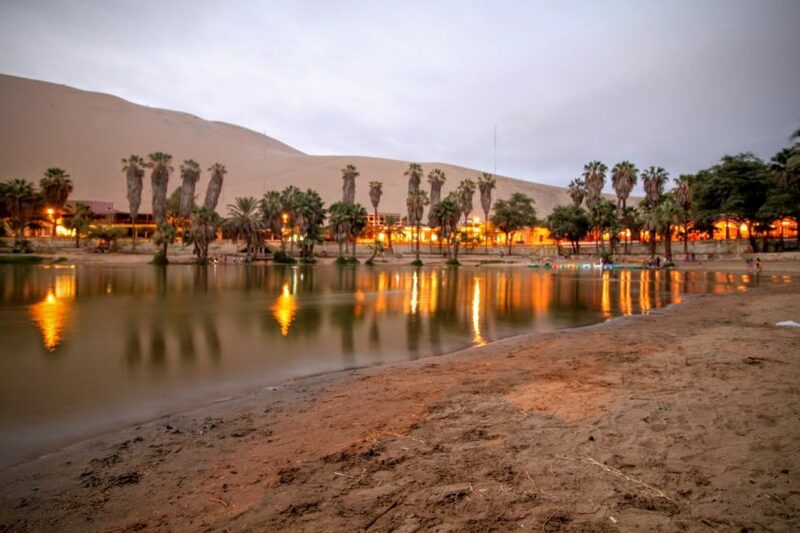 Haucachina: a lagoon surrounded by hotels, backpackers, tour companies and dune buggies, in the heart of the desert. 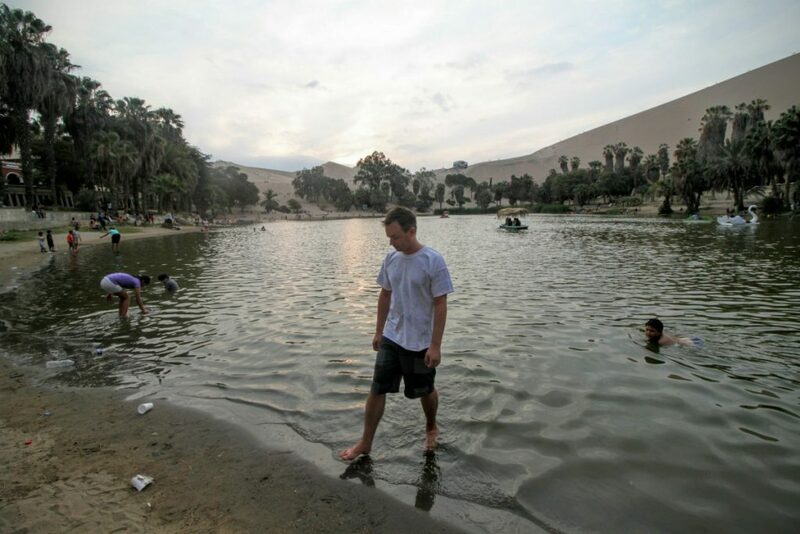 First impressions of Huacachina were hard to make. In spite of our best intentions, we arrived in the town well after dark. We checked in, ate in the on-site restaurant, and went to our room. Our accommodation Casa de Bamboo is true to its name: although made of brick, most surfaces are covered in a bamboo façade. The fences and balcony railings are made from bamboo, as is the bar which resembles a pagoda. The look is effective and gives a tropical feel. The fact that the staff bring their toddlers to work means that the restaurant doubles as a playground, adding a family feel to the place. It feels more like a b&b than a hotel. Our first morning brought a bit of a shock. The view from our window was of sand, sand and, well, the neighbouring building. 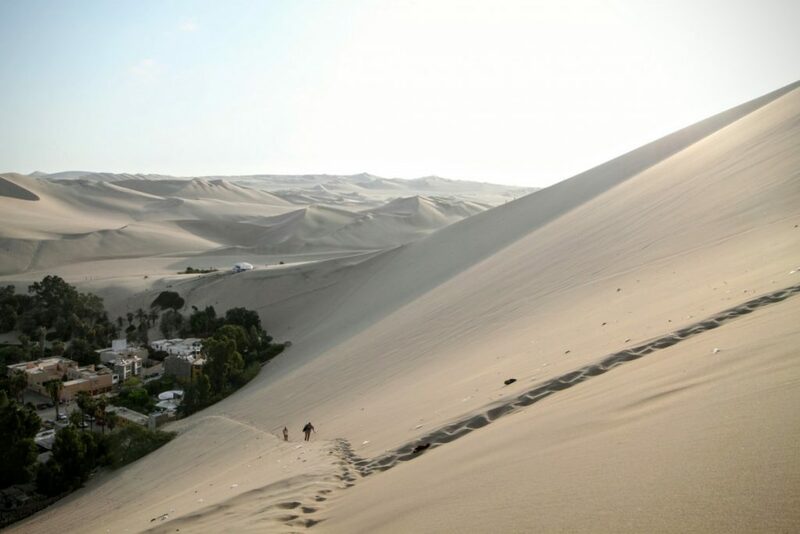 The dunes, which tightly surround Huacachina, increase the horizon by some 45°. How was something so massive invisible in the darkness? 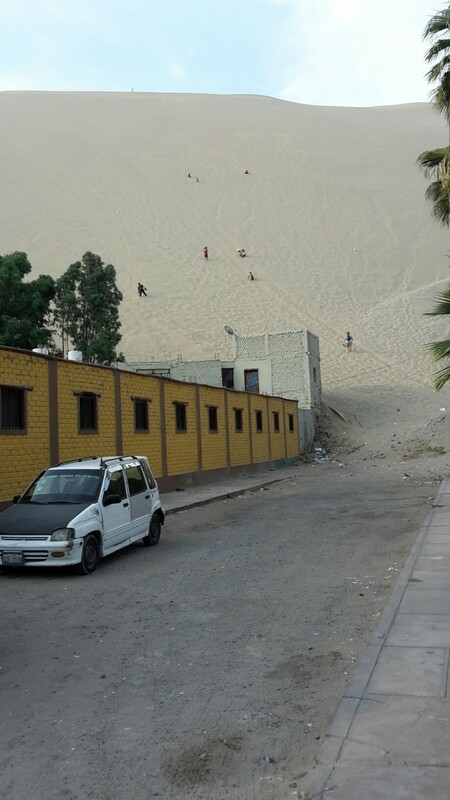 The dunes are so close that you can watch people climb up and sand surf down, from almost everywhere in town. Some building in the back street seem to be in the process of being swallowed back into the dunes. The buildings, consisting of mainly hostels and restaurants, surround a natural lagoon; it takes a relaxed 20 mins to circumnavigate. To my surprise the water itself seems rather clean and rubbish left on the shore by inconsiderate tourists is cleaned up nightly (but builds up throughout the day, in spite of the presence of public bins). During the afternoon and into the evening people swim in the lagoon, or cross it in row boats or peddle boats. 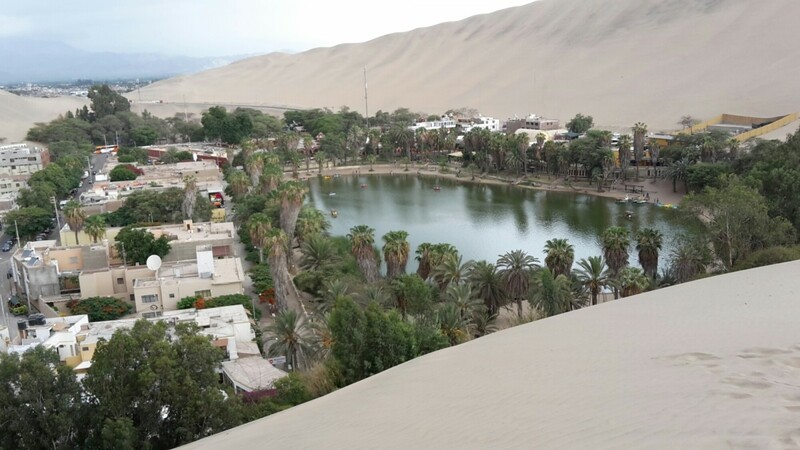 Given its small size, you can get to know all of Huacachina in an afternoon. 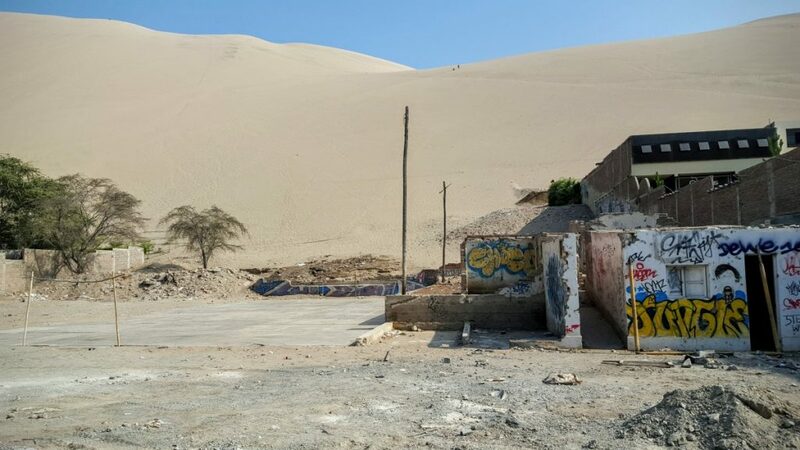 Most visitors use either here or Paracas as a base for day trips around the area. The desert heat is nice to escape from in the middle of the day. Buggies, which seat a half dozen people, depart regularly for the dunes. They are mostly clapped out V8’s with tubular roll bars that do laps of the dunes for thrills. You can hear the occassional roar of their engines from everywhere in town until sunset. you’re out of your depth, you see those kids down there? That’s where you should be! Ouch! but probably true. So I sat at the peak of the dune watching the experts. They were flying down, zig zagging, and doing tricks and spins. 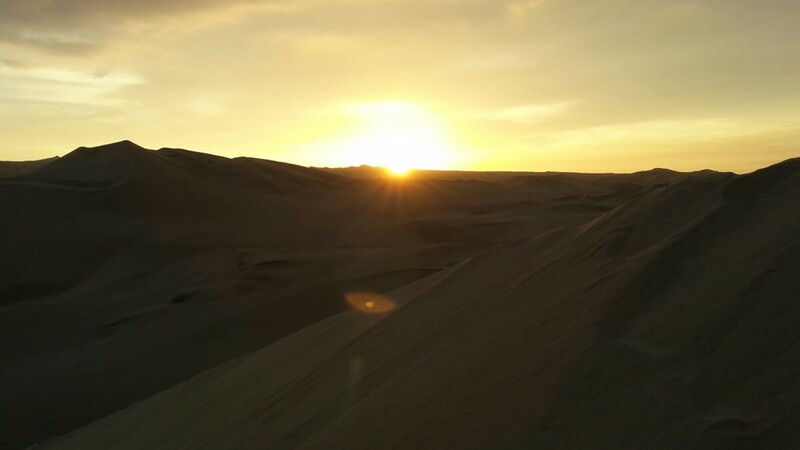 The view of the sunset was pretty awesome, nothing but sand dunes as far as the eye can see. 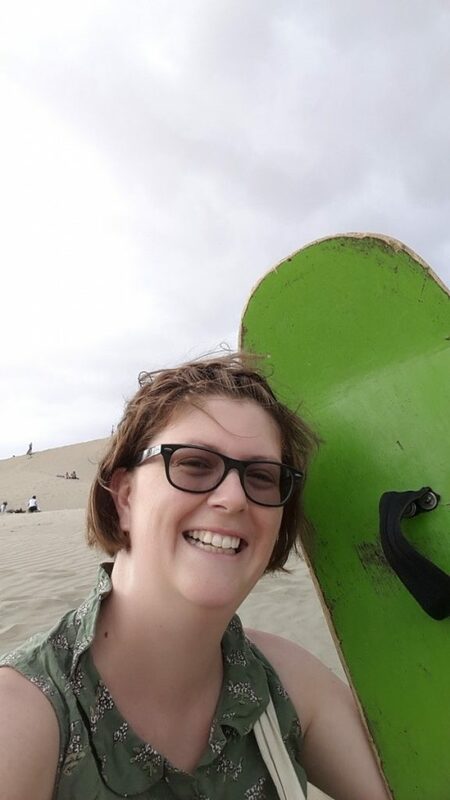 I rode down the dune’s shallowest slopes whilst sitting on my board, a smart choice. Then finished the outing by showering all of the sand out of every crevice and orifice. 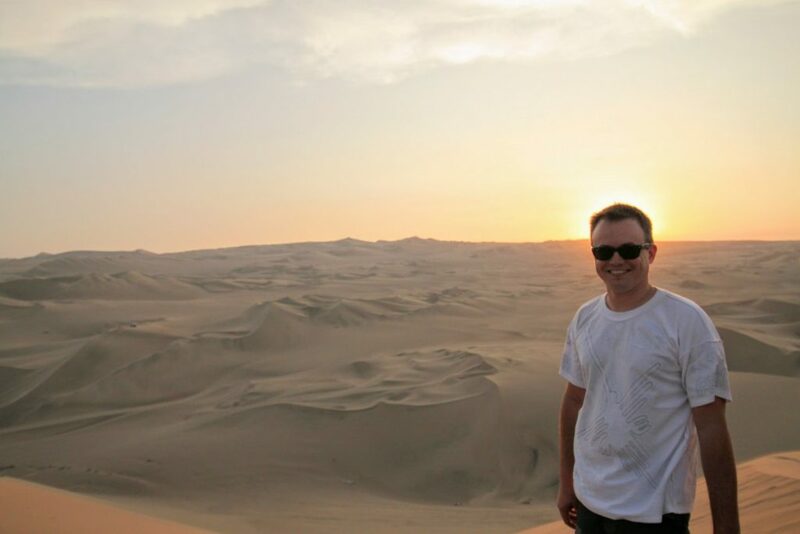 Michael says: I climbed the biggest dune for sunset. Quite the view, with desert all around wanting to engulf the nearby city of Ica. I met a Canadian couple half way through a 10 month trip up South America, and they let me share their beer. I returned the favour later. At least Renée was smart enough to bring a board for the way back down.